It’s a tough job, but someone’s gotta do it! I can’t believe another month has passed! It seems like I was just documenting your 4th month yesterday. I agree, it’s just nonsense! Well, 1 thing’s for certain. You keep growing. As shown above, you are chunuuuu-nky & never mind what I was saying last month about those rolls. It seems as though I find a new crease to wipe every time I change your diaper. I am so in love with you buddy bear! It is true that when you have a child, you can’t imagine loving another as much but with each precious soul, your heart in fact expands, allowing you to love more and greater and deeper! I have been telling daddy a lot recently how blessed I feel to be able to experience the specialness of the mother-son bond. I imagined the relationship would be quite different from one with a daughter but never this cool! It’s hard to describe. Maybe it’s a little to do with the fact that with the girls, I feel the added responsibility that they will look to me to model themselves after, as a woman, and perhaps a wife and mother one day. And while, I have a profound and everlasting impact on your life as well, and will be the one teaching and disciplining throughout the day and do my best to always point you to Jesus, it’s not the same. You will have your father to look up to as far as how to be a good initiator, leader, and a strong yet gentle-man. But with me, I feel as though because we are made differently, there is a very special appreciation and complimentary harmony. Yes, you are still a baby, but the dynamic is already so different. So unique. Like I said, it’s hard to describe. And maybe it’s because in you, like daddy, I see yet another facet of God. I am constantly reminded of the infamous verse in Genesis: “God created mankind in his image; in the image of God, he created them; male and female he created them.” Your male-ness (yes, I made up that word) and masculinity reflects an aspect of God that could not otherwise be known. And well, I’m just so excited to see our relationship unfold and all the things you will surely teach me. *Rolling around like a little worm. It seems every time, I put you on your back and walk away or turn around, the next thing I know, you are on your tummy grabbing a toy and scooting around in a circle. *So aware of your surroundings. You can spot any of us from across the room and you let us know with a big grin. *Most often caught gnawing on your extremities or watching your sisters in action. *Lunging forward (especially in the bath which makes it quite a work out with your 20 pound resistance). But also in your bouncy chair and swing. Long gone are the days of sitting in my lap like a doll. You are squirmy now and want to be free of constraints. Crawling is just around the corner. Happy 2 Months & 31st!!! Love all these pics and can’t believe how fast the time is going…. He is a beautiful blessing! 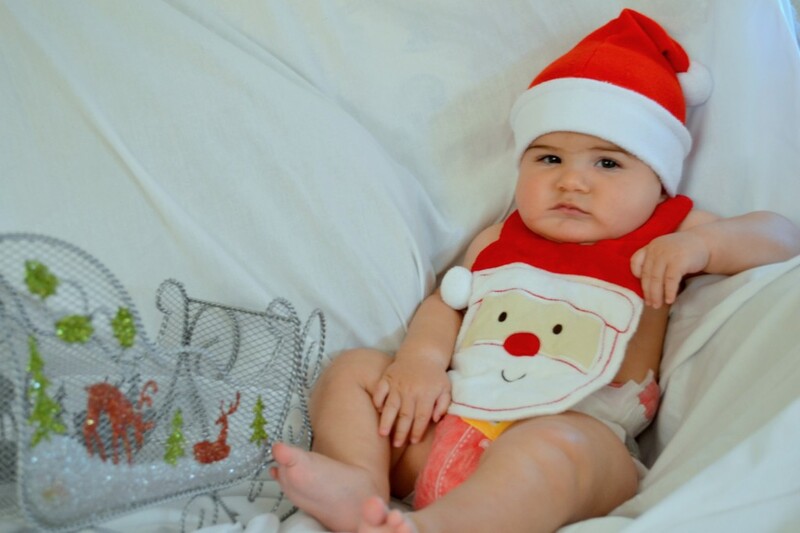 I love the Santa diapers! I saw them the other day for the first time. Sooooo stinkin cute!! PS I definitely think he outweighs Tyler…we are nowhere near 12 mos clothing yet! Again, such words of incredible insight, inspiration and wisdom. I swell with pride when reading your reflections, not because I contributed anything towards your maturity, but because you have a gift and use it so unselfishly.